Do your children wake up way too early in the morning? Do you wish they would sleep more? Or is nap time just not long enough? I am sure if you are a mother than you have answered yes to at least one of these questions. If you want to try something different and fun, I suggest the Sleep Buddy. The Sleep Buddy is a system created to teach your child or children to wait for the light on the Sleep Buddy or "night light" to go off before they can get out of bed. Sleeping in a bed but not staying through the night. Three simple steps toward sound, healthy sleep. Present and explain SleepBuddy to your child. The system includes an engaging children’s book to help your child understand the concept. Program the soft blue light to turn on for scheduled nap time and when it is time for your child to go bed at night. Place the light in his/her room where it can be seen from the bed. Record your child’s progress with the included incentive chart and smiley stickers. When a goal is reached, choose a reward that you feel is right for your child. My boys are pretty good sleepers but they do have their nights and mornings where they wake up at the crack of dawn. I tried the Sleep Buddy and it did help. There were a few times that it didn't matter the light was still on, JJ still got out of bed, but he is not perfect. This will be a great tool for us as Little L gets closer to moving to a toddler bed, that boy needs a method like the Sleep Buddy, he is a wild one! 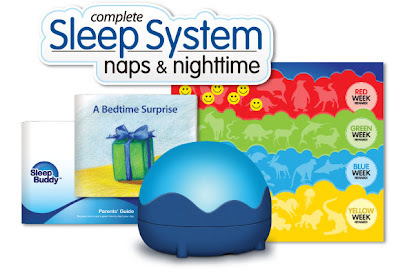 One of the really cool things is you get an incentive chart and stickers, this was a great way to motivate JJ to stay in bed :) Overall I liked the Sleep Buddy and recommend it to those of you looking for a solution to "Mommy Brain" due to lack of sleep. Win a Sleep Buddy for your little one. Who needs a little help with a Sleep Buddy in your family? *Limited to US residents; 18 years old and above. Giveaway starts March 12, 2012 and ends on March 24th, 2012 at midnight PST. Winner will be emailed and has 48 hours to respond before another winner is selected. I was not paid for this giveaway or post. The opinions on this item are 100% mine and may vary from others. The sponsor is responsible for providing the prize. i like sleep buddy on facebook! i follow sleep buddy on twitter! my oldest daughter has some serious sleep issues...would love to try this! My daughter needs sleep buddy! My daughter needs one to remind her at night and my son needs it for the morning. They are in bunk beds so it would be perfect. My 4 year old could definitely use a sleep buddy! My son could use the sleep buddy. LIKe sleep buddy on Facebook! My niece is having problems with her little one, and could definitely use this! My daughter needs a sleep buddy. She always gets up too early! I like Sleep Buddy on Facebook (April Gilbertson). I follow Sleep Buddy on twitter as @irishmarmalade. My kids could all use this. I like Sleep Buddy on Facebook. My daughter needs the sleep buddy! Thanks for the giveaway!